It's the only time you'll be proud to show off a growing belly! Why not do it in style? A fun combination of pastels and chocolate brown with stripes, polka dots, and a playful "Oh, baby!" background. 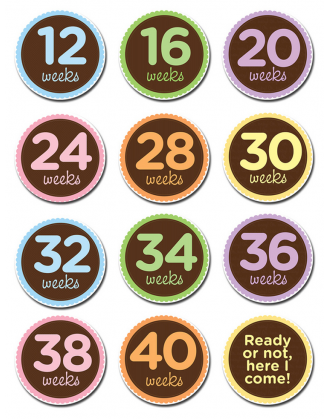 Set includes 12 stickers to track your pregnancy (every 4 weeks until 30 weeks, then every 2 weeks until 40 weeks). Set begins at 12 weeks. Also includes a "Ready or not, here I come" sticker. Don't forget the picture right before you go to the hospital!